A biography, commonly known as a bio, is defined as a detailed description of a person’s life. Rather than dealing with the basic facts of the subject’s life like education, work, relationships, and death; it portrays a person’s experience with life events, presenting a subject’s life story, with highlights of various aspects of his or her life, including intimate details of experience, and may even include an analysis of the subject’s personality. Biography’s are usually non-fiction in nature but fiction can sometimes be used to portray the subject’s life. One form of biographical coverage is called legacy writing that deals with in-depth research. At first, biographical writings were merely a subsection of history focusing on a particular individual of historical importance. The independent genre of biography began emerging in the 18th century reaching its contemporary form at the turn of the 20th century. Biographical research as defined by Miller is a research method of collecting and analyzing a person’s whole life, or on occasion a portion of their life. This is accomplished through the in-depth and unstructured interviews, or even by semi-structured interview or personal documents. In short the research can come from “oral history, personal narrative, biography and autobiography” or “diaries, letters, memoranda and other materials. Authorized biography which is written with the permission, cooperation, and at times, participation of a subject or a subject’s heirs. An autobiography which is written by the person himself or herself, sometimes with the assistance of a collaborator or ghostwriter. The idea of writing our own biography is a daunting one for most of us and knowing where and how to start can be the main stumbling block for many. What to put in and what to leave out! With other members of my writing group, I helped produce a memoir writing guide, which gives pointers on how to collect and compile artifacts, photos, letters etc. into a themed collection enabling you to format and theme your memoir/biography. The practical suggestions included in the pages of this book will suggest to you ways you can identify, record, and organize your collection of memories so you can begin to write your stories. It is not a how to write but a how to begin workbook. Have you thought of writing your biography? 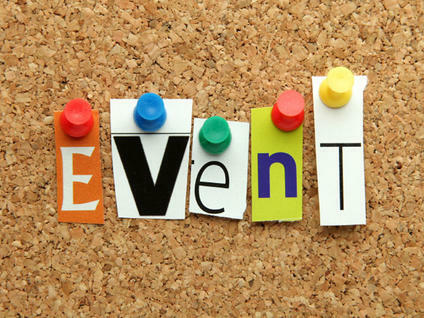 After a quiet weekend dabbling in a manuscript and reading, this week I have a couple of writing related events. The first is a workshop organized through my writing group. 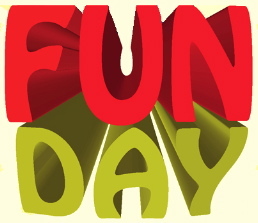 It is an interesting theme and I’m sure we will have fun with it. How can I add wine or alcohol to a story to enhance it? Can a drunk add interest to a story? How can I talk about these topics believably in my writing? And, as for whining – what could that possibly add and how can one whine in writing? Do you attend workshops? What benefits did they give you? My second event is the regular writing group for seniors I co-host with another member of my writing group. It is always a fun and enlightening evening. The stories of days past and the experiences these wonderful seniors have lived though are always amazing. Have you heard stories from your elders? Did you write them down? Our group’s memoir guide book can help organize memories into a cohesive format utilizing photographs, objects and letters etc. It gives a great kick start to your memoir. The non-writing event I will attend this week is to see the Cirque du Soleil – Kurios with my daughter on Saturday. really looking forward to it. Have you seen one of their shows? There seems to be a plethora of upcoming events on my calendar at the moment. Some are writing related but others are with family. These are only the highlights! This weekend I will accompany my daughter to a reptile show. She has a table and will be selling several lizards of the leopard and crested kind as well as accessories for the maintenance of same. She has prepared a new enclosure in her reptile room (yes it’s in my house and I’m fine with it). She will be purchasing a chameleon – an animal she has wanted for over a decade. If you are in the area why not drop in and discover fascinating creatures. 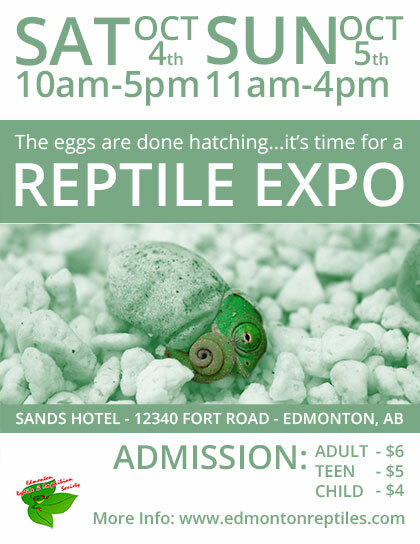 http://www.edmontonreptiles.com/ Sands Hotel, Fort Road, Edmonton, Alberta. Saturday & Sunday. With Thanksgiving on 13th October – my family will enjoy a meal together in the new home of my son and his girlfriend. We prepared apple pies for the occasion a couple of weeks ago utilizing the bounty of their own apple tree. 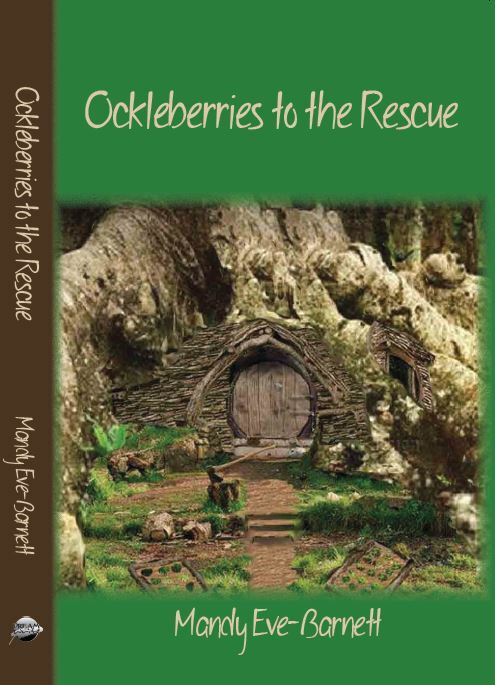 On 25th October I will be attending Words in the Park http://words.sclibrary.ab.ca/ launching my new children’s book, Ockleberries to the Rescue. 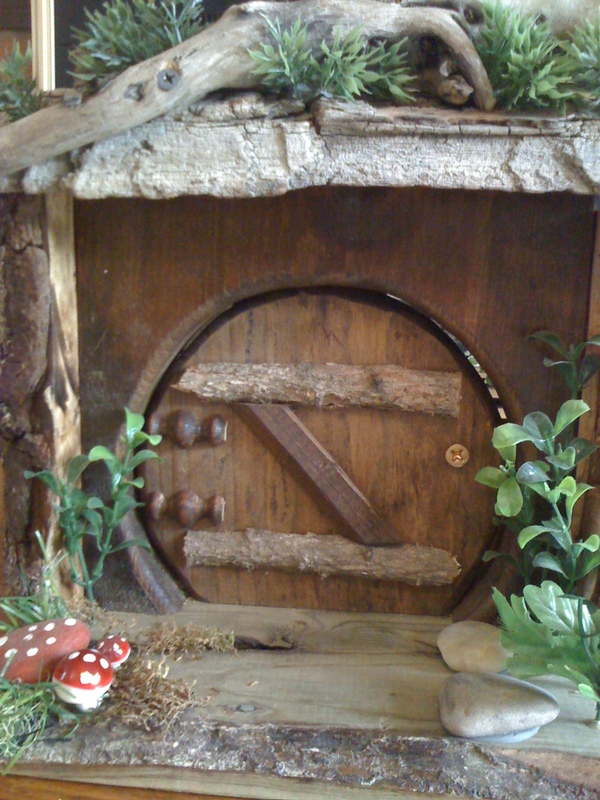 And will of course use the delightful door I purchase some weeks back. As I have a whole table my spare time for the coming weeks will involve positioning my range of books in the best possible way to attract people to my display. I will divide the table into four so each book has it’s own unique place with relevant display items and promotional materials beside them. 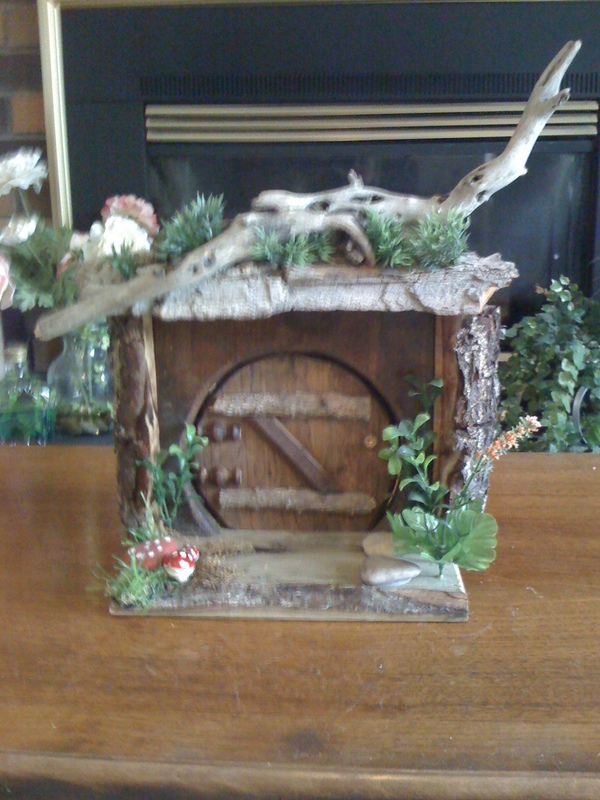 Ockleberries with the door and animal ornaments, Rumble with his prizes for the competition winners of hats and T-shirts and special books marks and glowing orb for The Rython Kingdom as well as writing items for Your Lifetime of Stories (memoir workbook). How is your calendar looking? I thought today’s prompt could be about pets – either some you have always want to own, pets you do own or pets you would never have! This week has my writing group hosting their AGM and my publishing company attending a book fair. This entails my time in planning for both. As secretary of the Writers Foundation of Strathcona County, I am responsible for the minutes at the meeting but also to ensure notification and reminders have been sent to the membership, that we have copies of last year’s AGM minutes and an agenda. As well as ensuring the Bylaws and Policies binder is up to date and present for viewing. On Saturday, I spent time with the Treasurer, Linda J Pedley, creating the agenda and a President’s report. This was after I had driven to Leduc to record the inventory of Dream Write books in the Leduc Artisan Market and to pick up a Ockleberries to the Rescue promotional item. (See below). We will hold the AGM on Tuesday 16th September and begin another year – our 10th anniversary – with new vigor and plans for a writing conference on 2nd May 2015. Once the writer’s group business was completed, we began planning for the upcoming weekend’s book fair. This event – Words on the Street – is Canada wide and well worth visiting in your location. You have the opportunity to meet authors and hear them read from their current book, purchase and have books signed, receive advice from publishers and find a writing group in your area.Dream Write Publishing will be in stall #17 – opposite the library entrance – so come along and say Hi and also meet the members of the Lethbridge writing group, The River Bottom Writers, who will be next to us. All of Dream Write’s books will be available for sale and some for pre-order, such as my Ockleberries to the Rescue children’s chapter book. Immerse yourself in literary endeavors for the day. Hope to see you there.